It makes a lot of sense to start looking for a Manassas roofing contractor at the start of a new season, but many homeowners tend to wait until the need for roof repairs or replacements becomes more apparent. Maybe it’s a matter of avoiding “unnecessary” spending, in which case waiting is actually counterintuitive. This is because holding out until the damage gets worse is a guarantee that you’ll end up spending more on repairs. 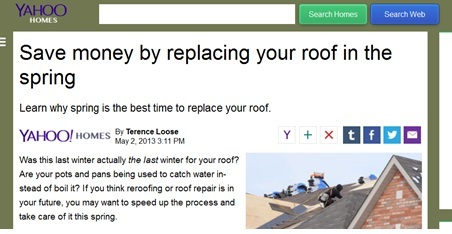 If you think reroofing or roof repair is in your future, you may want to speed up the process and take care of it this spring. Why? Because replacing your roof in the spring could provide a number of benefits that you won’t see during other times of the year. These benefits include convenience, more choices, and perhaps the best benefit: less cost. As for the amount you could save, he says it varies, but a 10 to 15 percent break is not unusual. However, Jarvis always advocates getting at least three estimates to make sure you get the best rate. There are a lot of roofing companies to choose from, so take advantage of this opportunity to pick out the best one for your needs and budget. Peak Roofing Contractors is just one of the many roofing companies in Northern Virginia, but they set themselves apart with their undying commitment toward providing excellent quality and value to property owners in the Arlington, Prince William, Fairfax, Loudoun, Fauquier, and Culpeper counties. Peak Roofing Contractors offers not only a full range of quality products from top manufacturers, but also the service benefits that come with their 2 decades of roofing experience. The company has their very own Price Match Guarantee for full roof replacements, which is your assurance that you’ll get nothing but the best rates. They also provide discounts for senior citizens and military personnel and offer clients $100 Visa gift cards for referrals.